Two lines are said to be parallel lines when they originate from two different points and lies on the same plane and never meet each other. The distance between these two lines are the same over their entire length. There will not be any common point on the plane. Now, we will see constructing parallel lines. We have to do preparation for constructing any two lines which are parallel to each other. The parallel lines will lie on the same plane and are called as the co-planar. The lines are parallel to itself and they are supposed to satisfy the condition that the slope of the lines must be equal. 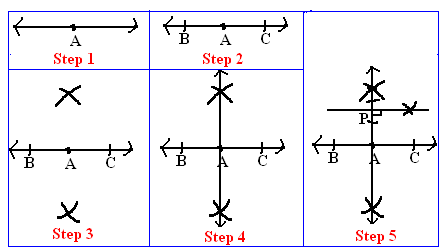 There are some important steps to be followed to constructing parallel lines. The steps are explained as follows. Step 2: Here, we have to draw perpendicular in a point A. Take a compass of certain radius and cut both side of A taking A as center. Step 3: Now take a compass of radius more than length of BA or CA. First, take B as center, take compass of radius more than the length of BA, cut above and below of line BAC. Repeat the similar process taking C as center. Step 4: Now join p and m. This will be perpendicular to line BAC. Step 5: Now repeat the same process to draw perpendicular line at point p which should be perpendicular to line PA. So, the new line is parallel to line BAC. There are some important steps to be followed to construct parallel lines. The steps are explained as follows. Step 1: Draw a line PQ and take one point R above this line. Step 2:Now, join the point R with the line PQ so that it will make some angle. Here, it intersects the line PQ at the point J. Step 3:Now, take the length of compass as half the length of RJ and draw an arc taking J as center. Step 4:Now with the same arc width, draw an arc taking R as center. Step 5:Now set the compass width so that it is equal to lower arc. Step 6:Now take the compass above and cut the point at above arc, taking intersection of upper arc and line RJ as center. 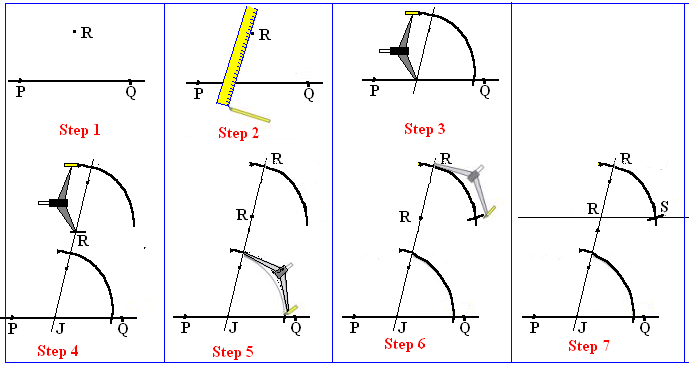 Step 7: Draw a straight line that will pass through the points R and S.
So, the line RS is parallel to line PQ.